And I meant a “plausible story” without conspiracy theory involved,… like faked satellite signals, or a coverup.. Using that it is easy to create any scenario, since the plane left nothing, no wreckage at the site, no noise in the sea.. Without that “real” story the result will be that everyone cries coverup… I was curious to see if it was possible to come up with an explanation. It will require a bit of perusing the internet but everything you mentioned is out there, in one form or another. After 4 1/2 years, discussion tends to be a bit cyclical so there should be ample opportunity to locate all the information. While reviewing some older saved links, I found this, from back in the days when you had some support. “If this coordination points to a produced disapperance, rather than a “perfect storm” of random occurance, the motive and the orchestration of it, cannot be viewed simplisticly. I agree. The pilot alone, could not have possibly pulled off something of this complexity (and magnitude). My bias therefore, purposeful. Meaning, not a “bias” so much as it is the truth that I know in my bones – the temperament character of my grandfather, as evident vis-a-vis my mother, my aunts/uncles and just simply, how my family is. From that, you have to trust me, people who fly planes out of passion do simply not go around plotting mass heists like this. They are two different skill / temperament sets. The pilot’s at-home flight simulator was simply a sign of how much he loved flight. My grandfather would have built the same. Not to mention, if the pilot were in some kind of emotional due to problems with his wife, he certainly would not have been able to pull off the aviation mystery of the century. Even with zero emotional problems, no pilot would have been able to pull off something like this — including my grandfather, who (if I may) was far more skilled a pilot. I thus also agree with the sound reasoning by @JeffWise that to the degree the Malaysian government was corrupt, is the exact degree we should believe the pilot is innocent. Pilots are easy targets — since, uhh, they fly the planes. As a corrupt politician would very well know — that is, who would make an target upon whom to deflect the blame. Targeting / deflection: the fundamental skill set of a corrupt politician. The way a surgeon is skilled in fixing the human body, a farmer skilled in growing seed from soil — the corrupt politician skilled in manipulating public And worse — the temperament, to want do just that. Specifically by playing into human psychology, as mentioned in my first comment — the human mind tending to only probe to the edge of the familiar and the known. The story of “he had problems with his wife” is something the general public can wrap its head around. They might not like it, but they can wrap it head around it. A complex operation however, not something it can wrap its head around. But the angry families and public needed an answer and blaming the pilot was the easiest way to try to put the matter to bed. Nice words about your grandfather. When no other individuals emerged as likely suspects, the lack of competition seemed to promote Captain Zaharie as prime suspect. Means rather than motive became the driving force and without any factual information extracted from Z’s life to incriminate him, an illusion of motive was created by manipulated conjecture. I found discussion of it awkward and shameful but nonetheless it passed mustard in discussion, long enough to keep Captain Zaharie relegated as prime candidate until the sim data was “leaked”. After the precipitous sim data “leaked”, all cards were off the table and no other suspects were considered. The data crunchers went back to work, the only option was the pilot did it camp felt vindicated and the data once again took center stage, now accompanied by the sim data. Why was information promulgated from Najib’s regime not automatically suspect and challenged before ever being considered as valid. The dishonorable/criminal history from the Najib reign was well qualified to be culpable for MH370 while the history of Captain Zaharie’s was not. Yet, the heinous history of Najib and his government escaped an obvious assumption of guilt, while Captain Zaharie’s virtually flawless history, did not. For me its an impossible accusation that this man committed this mass murder and I no longer wish to understand the mind that covets such an opinion. @Jeff I am reading a MH370 book that mentions the ACARS system had two functions, one of which was engine monitoring. Also mentions the MH370 ACARS was supposed to transmit every 30 minutes normally. We only got hourly pings, which were from the engine monitoring function. This could explain a lot.. Has nobody actually tried turning off a ACARS from the cockpit and see what happens? Maybe this exact thing happens.. that it stops transmitting every 30 minutes and switches to hourly..
At 17:21:13 the transponder was turned off, maybe 4 minutes later the ACARS was set to off. One hour later at 18:25, the engine monitoring system re-activated the ACARS and began the hourly transmissions that it normally does, all unknown to the pilot.. with the ACARS still set to off. So possibly, this could be explained without something turning things off and then back on again.. but just by turning something off only. Has this been looked into?.. Could there be a way to set ACARS off but still have transmissions from the engine monitoring function? “…all unknown to the pilot”. Are you sure about that? An alternative explanation was that “the pilot” was very aware of what was going on. The reason we know the SDU was turned off (or lost power), is because it was turned back on at 18:25, which caused a flurry of logon communications and signals. Hourly pings will happen anytime SDU is on, but there is zero communication activity such as ACARS transmissions, Sat phone calls, etc. If you want be in the vocal minority arguing in favor of electrical interruption, feel free to do so. But the overall sequence of events appears to most consistent with intentional diersion, including manual turning off of transponder, and ACARS, and selected electrical systems for the purpose of turning off satellite transmissions. P.S.- Classic Aero is the Inmarsat system used by MH370, but not all of the capabilities were activated, for example, I believe the FI discusses that the the handsets only allowed seat-to-seat phone calls. @TBill I was actually saying the opposite. What I said was, maybe the re-login was by design of the aircraft. Malaysia airlines said was standard practice to turn off ACARS when flying over China. So, maybe in this off mode, the hourly transmissions happen automatically, and they trigger the re-login. I don’t know how the Acars modules work, and how the engine management data is triggered, but someone would and they could explain if the re-login would have happened automatically, without any switch or anything being pushed. What we know for sure is, the acars reports were turned off, and stayed off. So the re-login does not mean something was “undone” .. It’s only indicating the remaining engine management system came online.. which I thought could happen automatically. Also, after reading this “Mystery Solved” book on MH370, it is only by assuming uncontrolled flying that they came to the -2hz on the 7th ping.. Which given all the hard facts in the book, I am on the side of the author. He seems extremely knowledgeable, and the visual information is hard and next to impossible to dismiss.. I even had some of the same conclusions about the photos of the wreckage that he had, before reading anything. So they assumed uncontrolled flying led to the “spiral down” scenario, which may have in fact have been “turned around to land” scenario..
Or turned left/right. The author also gives an idea that the re-logon could have been triggered by switching to the APU, to aid landing, since the engines would be ripped out and control lost. I find it crazy the official investigators did not calculate ANY model to account for the 7th ping other than continuing to fly straight. The author says it would have been very difficult to calculate without assuming straight flight. I think if the DST group put their heads together, accounted for the wind on that day over the ocean, and tried to fit a turn for an against the wind landing to match that 7th ping, they may find that it fits just as well as a spiral down. If this was a controlled ditching, I would be betting for a U-turn of the aircraft. Having spotted that the “coast is clear” and no ships etc. are nearby, whoever controlled the plane would’ve likely turned it around to land in the spot that was already checked to be clear. Maybe the wind was coming from the North and that’s the prevalent.. This map is currently showing from the north, north-west. I really hope somebody will do those calculations, and reveal the results, if only for informational purpose.. even if nobody is going to search there.. it’s at least one other possible scenario, especially since the initial scenario has failed to find anything. Including that the ground-to-plane phone call failed completely, which indicates something was indeed off and came back on again. Also in the document it states “The Satellite Data Unit (SDU) powered up at ~18:22:30” Which becomes even more crazy. The radar contact was lost at 18:22:12.. So just 18 seconds once contact is lost on radar, someone mysteriously decides to let us know where the plane is via the SDU…? I think the chances of that happening without it being planned are extremely small.. The hourly pings originate from the INMARSAT ground earth station, when one hour has passed without contact with the airplane. We also have SATCOM log-in requests that originate fromm the airplane after the SATCOM link has been interrupted. Loss of the SATCOM link can have several causes, but loss of electrical power is the most likely explanation. ACARS cannot be “turned off”. However, ACARS can be configured from the cockpit so that it cannot use HF, VHF or SATCOM communication systems to send messages or reports. That probably happened. The official investigators considered all speeds up to 500 knots on all headings between North, East, South and West. The Final BFO of -2 Hz can only be explained by a steep dive, and the change between the last two BFO’s in 8 seconds can only be explained by the rate of descent increasing 10,000 feet/minute in that interval. I am not aware of turning off ACARS over China, but they go to satellite mode ACARS communications vs. radio ACARS transmission for commercial reasons (cost/etc.). I agree with you that passive-pilot flights have been given the most priority for the search to date. 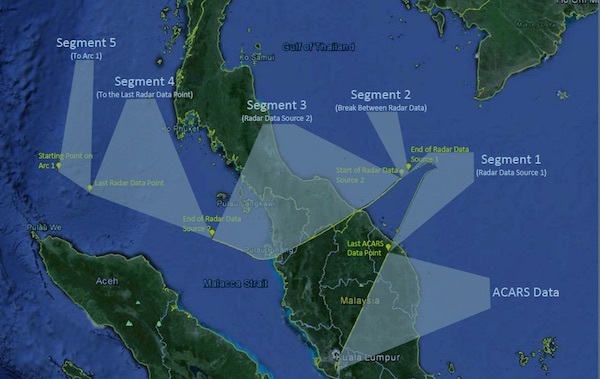 It is indeed lucky to get the first SDU logon immediately after the last radar, but keep in mind there is some skepticism about the last radar point, as Malaysia has not shared enough military radar data to give folks confidence in the data. Those are two good references (Vance and Captio), but in both cases they are a little bit unique if not contradictory viewpoint compared to say IG or ATSB so must be taken in context as another hypothesis. Malaysia airlines standard practice is to turn off VHF for ACARS when flying over China. ACARS remains operative using SATCOM to communicate. @Gysbreght Great info. So the mystery remains.. despite the “Mystery Solved” book.. which is that the satellite information does not correspond with the analysis of the wreckage.. I find it very hard to believe a plane could impact the water in the way described and not be picked up by a hydrophone. Also, the physical evidence as described in the book shows otherwise and is very hard to dispute. But why take the plane, fake it crashed nose down somewhere, and land it on water somewhere else?.. still makes no sense. I wonder if the plane could have been already in the water or gliding on water during the 7th ping, and the BFO values became messed up during the 8 seconds as the electrical circuits were starting to short out and antenna starting to be submerged? Could a transmission during the impact have caused the BFO error? We know that it was partial and it quit during the transmission, so there is the possibility this transmission was happening during a water ditching. It’s also interesting that the FO’s cell phone was picked up, which I believe means he was holding it by a window, trying to get a signal.. That would suggest there were not hijackers holding them hostage and watching them. I have successfully got a GPS signal on a commercial flight by holding my GPS at the window, it took quite a long time, about 5-10minutes, but moving it away from the window immediately lost connection. @Chris: The descent could have taken more than 20 minutes, as in several passive simulations conducted by Boeing. A high rate of descent during 8 seconds, two minutes after the loss of power, in no way implies that a high rate of descent was maintained all the way until impact. However, among the recovered floating wreckage were parts of the interior, which indicates that the fuselage did not remain in one piece. Therefore, if a ditching was attempted, it was not entirely successful. That in itself should not surprise anybody. I have not yet read Larry Vance’s book, but he is claiming a flaps-down, slow, attempted safe-landing style ditch. As Gysbreght said, that is contradicted by (1) internal cabin debris, but also (2) the ATSB has determined flaps were probably not expended, and (3) no ELT transmission. Seems to me and others that Vance might be partially correct: perhaps it was a high speed, flaps-up, non-survivable ditch. That could explain a glide from Arc7 and debris condition, and also break the fuselage for relatively debris-free fast sinking. Bottom line, is that there is much ambiguity in the known facts/debris. @TBill, @Chris, Larry Vance is not a reliable source of information, for reasons I’ve described before. @TBill Vance claims the right wing was the first to catch the water and rip off, which led to the small amount of debris to come out from inside the cabin. He also points to quite a few pieces of debris that separated which were on the outside of the aircraft. He claims flaps were extended, and gives all the details of how they were pulled out of their slots, the marks they left as they were separated, the erosion on the trailing edge as they dragged on the water, etc.. The witness marks on the pieces he examines especially the flaperon tell the story. He could be wrong.. I’m no expert in debris analysis,.. what he points to makes sense though. Only another expert could cast doubt on his claims by giving another version of what could’ve cased the flaperon trailing edge erosion, the way it was “pulling out” through the hole in the seal pan, and the lack of any smashing on the trailing edge, which I think would’ve been completely crushed if it went nose down into the water..
Don’t you find it odd that that trailing edge is all eroded/shaved ?.. That trailing edge would’ve been scrubbing on the water.. which would leave that exact pattern. A nose-down crash should’ve crushed the leading edge inward, and possibly dented/smashed the thing, but the erosion is fuzzy, like a scraping, not like a one-time smash. The ELT was not designed to work in water, and it would’ve taken quite some time for it to activate and manage to send a signal. By then it could’ve sank, especially with the right wing torn off and water rushing in. I wonder what happened to the miracle on the hudson flaperon… would’ve made a great piece to compare. Possibly a flaps-up high speed ditch like this coud explain the flaperon. I believe photos of the Hudson miracle flaperons are available and do show somewhat similar damage. What incidents was 9M-MRO involved in that would require its flaperon to be taken out of service and a temporary service spare be put in its place? Still intrigued by the fire in the MAS repair shop….. The purpose may have been, in a few quick actions actions accomplished on the cockpit electrical panel, to remove power from the Flight Data Recorder and Cockpit Voice Recorder, and to silence ACARS. Then, after re-configuring ACARS, pulling circuit breakers to specific equipment, etc., power to the electrical buses could have been restored because the autopilot was needed for the remainder of the flight. 3°) Setting the Bus Tie switch on ISLN (to neutralise the transfer backup mechanism from the rightside or from the APU which would be activated by the ELMS). Seems quite complicated.. It would’ve taken a lot of studying to figure out that these actions would result in what was needed, and no other things are affected. Would a simulator like the captain had at home be able to simulate something like the steps above? I think he just had FSX? I wonder just how much of this info is in the 777 manual, and if it was, then anyone motivated enough could’ve read the entire thing and figured it out. Looks like FSX does have everything mentioned.. the switches for L/R Gens, BU, and Bus Tie. Page 42. I wonder what the consequences of doing the above steps in FSX would be.. Is it programmed in such detail that it shuts down the correct things that are tied to each generator?.. I’d also think it’s “crazy” to do anything out of normal if you never did it, and don’t know what will happen. But if you can simulate it, then it’s not so crazy.. You can get practice in the simulator and try all kinds of things until you get the result you want.. I’m a computer programmer, so I am very used to testing until I get the result I want. I’d imagine someone in a simulator doing the same thing. You an have unlimited number of tries, with no consequences. The biggest question is though, is FSX or any other simulator out there, realistic enough to have simulated something like cutting off generators and even playing with the pressurization and have a realistic result? I think if if someone did plan to do this, whoever it may be, they would’ve had to practice first and even create a checklist. They wouldn’t just come up with it on the spot. The switching off of Left Gen and Left Bus Isolation, are easy push buttons on overhead panel and included in the PSS777 and PMDG777 simulators. Captio is apparently suggesting that actually using these swicthes during flight is too risky to try on a real commercial 777 in normal circumtsances, but we are talking about a risky flight diversion anyway. Cutting off Left Gen gives more thrust to the aircraft and may help to explain the apparent high altitude climb at IGARI. Alernately the Left Gen can be kept running, and it could be electrically bypassed with the panel. 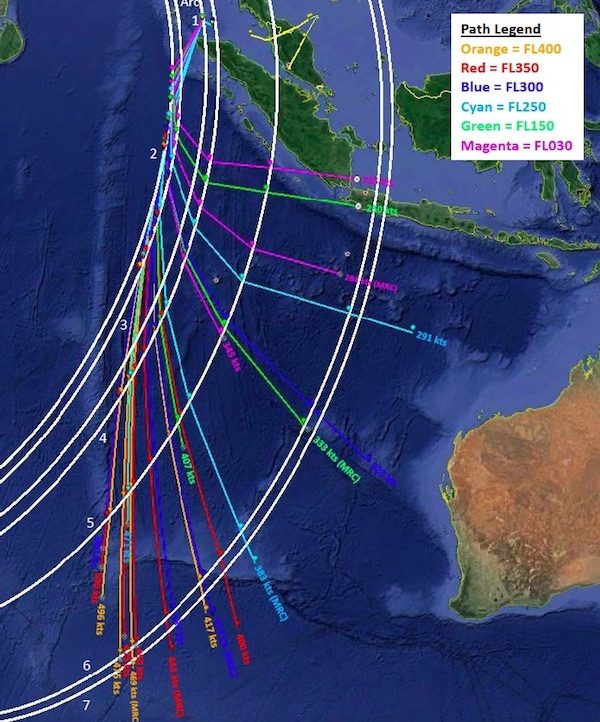 @Chris: On October 16, 2018 at 4:54 PM you quoted mh370-captio.net as saying: “… a much simpler way of de-activating the SatCom link is at hand (by using the CDU SatCom OFF command)”. Deselecting SATCOM on the CDU ACARS Manager page will silence ACARS (assuming VHF had been deselected earlier as standard practice on MAS flights to China). That will not deactivate SATCOM nor ACARS. SATCOM was definitely shut down at some time between 17:07:48 and 18:03:41 when the ground station received no reponse from the aircraft. ACARS cannot be shutdown. When it is silenced on the CDU ACARS Manager page, ACARS continues to generate the reports it has been tasked to generate, and will send those reports in order of priority once the communication link has been re-established, or at a convenient time. After the SATCOM link was re-established at 18:25 no ACARS messages were sent. Therefore ACARS was silenced at some time after 17:07:48. ACARS was tasked to generate flight progress reports every 5 minutes, and to send those reports in batches every 30 minutes. the batch scheduled for 17:37 was not received. Another task of ACARS was to generate Engine Health Monitoring (EHM) reports and to transmit those at specified times. The ACARS log for the preceding flight MH371 from Bejing to Kuala Lumpur shows that adter the TO and CLB reports five EHM Enroute reports were generated during stabilized cruise segments at irregular intervals, but were transmitted in the final minutes of the flight. Shutting down SATCOM by isolating the left main AC bus does not explain that the autopilot was off 40 minutes or more after the turn-back at IGARI. The autopilot will not allow flying at 43000 ft height with the Mach number varying between 0.88 and 0.91, as observed in the civil radar primary returns. That is why I suggested that all generated power may have been shut off initially. If you think that is “crazy”, then perhaps you also think that it is quite normal that someone diverts an airline flight and continues to fly it seven hours until it crashes due to fuel exhaustion. The final BFO values indicate that someone was in control of the airplane at the end of the flight. @Chris is simply quoting MH370-Captio.net as far as SDU Off CDU command, so the question really boils down, I wonder what Jean-Luc is talking about? (as nobody else has said that)…Seems like Jean-Luc is saying that he feels, instead of cutting Left Gen, the perps would have gone to MEC Bay to turn off breakers for SDU. The Left Right generators cannot be retarted in the air if disengaged, right? So if all power was off it was not due to actual physical shutting off of both generators, or is that possible, given the Back-up gen or desire to fly minimally? @TBill: The IDG’s have ON/OFF switches that cut off the power supply to the aircraft electrical system. These can be reset in flight. The Left and Right engine IDG’s also have a “Drive Disconnect” switch that disconnects the drive from the engine accessory gearbox. A drive that has been disconnected from the gearbox cannot be reconnected in flight. This has probably been suggested before but what if the shutdowns were just intended to increase time to fuel exhaustion ? A different motivation may produce a different set of actions that may or may not match the observations better. Correction Re – Kazakhstan post last month or so ago. Sorry I may have once again stated Daniyar Nazarbayev was the son of the Kazakh president but he’s of course the nephew. Since then, I’ve also stumbled across these articles from March – June 2014 about Eurasia Insurance Company, apparently Kazakhstan’s largest insurance company established in 1995 and headquartered in Almaty. Not sure what to make of this tidbit of info, or if there is any relevance MH370 apart from the innocent. @Susie Crowe, eloquently said. It is truly shameful how the Captain was scapegoated, amidst such criminal corruption of the Malaysian regime. I shall look forward to your further comments in the future, as future facts are revealed. My feeling is that future facts will be revealed if not immediately, given that corruption takes time to unravel. Two ways to increase thrust, or increase range, are to disengage the Right and Left engine generators, and turning off of the bleed air into cabin. So there has been speculation that climbing to FL430+ at IGARI could have been facilitated by these and other (unconventional) techniques to get more power. Also some speculation that reduced bleed air could extend range perhaps 2% or os. M.89 would ‘aid escape’ and as an added benefit increasing fuel burn early and reducing weight would allow an earlier landing than the planned ~7 hours in Beijing. What I realize after all of this debating in my head is that we will never be able to know what happened for sure. Even if “Mystery Solved” is absolutely correct, he still cannot know if the airplane was flown somewhere, and then ditched later in the ocean. Flying in or out of Diego Garcia there is nothing to track you.. nobody to see anything I believe? Is this right? Then they could easily fly out later.. even paint the thing black before coming back out. If that’s the case, then the plane could’ve easily been stolen and then painted and landed on water later. I can’t think of any better way to get rid of such a big piece of evidence..
From previous experience, I’d say the most logical thing has the best chance to be the one that happened, but I just can’t get over that huge satellite connection coming back online as soon as it would’ve been the perfect timing by 18 seconds coincidence, along with a dying last ping that tells us it’s diving in the ocean which turns out to not match with any microphone data or wreckage analysis. I know Jeff disagrees on Larry Vance, but I ask anybody who says it nose dove at high speed, where are the hundreds of tiny pieces of wreckage to match the satellite data? Hitting water at high speed is almost like hitting pavement. Fuselage skin is 1-2mm thick. Planes just cannot dive into the water and become submarines, they will break and crush apart into little pieces. Those type of images show planes are actually quite fragile. You can barely hit a bird with minimal damage. Decelerating an entire aircraft to zero and displacing a huge amount of water in a fraction of a second, it just doesn’t add up for me. Mythbusters: Pig hitting pavement, 17 fractures, hitting water, 7 fractures. You fracture bones hitting water.. it’s not soft.. you don’t just GO in and ZOOM to the bottom!.. this is a tiny big, not a giant airplane, and it still couldn’t go in and zoom to the bottom.. also look at the big splash.. water has to be displaced to allow things to go in, and it doesn’t do that quickly.. that’s why you get a “bam”.. A plane needs a LOT of displacement, and water will simply not allow it to go in easily. This whole “go in vertically” has also been said to have happened at Shanksville on 9/11 , which I also cannot believe… apparently if the media wants, planes can enter ground and water and without leaving a trace as well. We’re not even talking water any more.. now it’s ground!!.. Something magical happens when it’s vertical and the laws of physics stop applying, the ground and waters open up and let entire planes in, without pushing back at all. @Chris, Apart from the issue of the plane–we can argue endlessly and fruitlessly about how many pieces of debris each scenario would generate and how many would reach the shore–you need to understand that Larry Vance lied about heading up the Swissair 111 investigation. His credibility is zero. So let’s please stop discussing him. Quick question as I’m admittedly not up to speed. On one news segment early on, I heard that there are organizations (or govts) that have instruments that track the sound of large detonations around the world, and a plane crash would pop up on such a thing. The person interviewed said no crashes were detected during the approximate time. Any thoughts on this? You’ll see that the jet is essentially rendered to dust while the impact wall remains intact. A 777 moving faster, perhaps twice as fast, weighting hundreds of thousands of pounds more, even against water, would suffer a similar fate, for as you point out, the water cannot be displaced nearly as fast as the aircraft’s bonds, from structural to molecular. This explains the debris at Shanksville, as well–by no means an anomalous event. If you google something like “nose dive accident plane” you’ll see many other crashes that have left that similar dark smudge and little else on the ground at the site of impact. You might also look up Valuejet 592, which disappeared into the Everglades. The Miami Herald headline of the event: “Barely a Trace,” which accurately reflected a scene in which rescue workers found no debris larger than a dishpan. Another: Alitalia 112. In each case the laws of physics, regardless of what you interpret the media to have said, very much apply. The thought of anyone possessing knowledge of all capabilities used to monitor areas of the world and beyond, seems unrealistic. Many assets which should or could have potentially recorded MH370 activity have been discounted one way or another. Except of course, the Inmarsat and Malaysian radar data. Regardless, if we are unaware of all that was available or we are aware of all that was unavailable, that information imo will never be available for public consumption, the risk/reward is too unbalanced. Much of the hard evidence of 9/11 came from Flight 93 such as handwritten notes of the hijackers and weapons (box cutters) etc. The Flight 93 memorial is quite a thought provoking visit. I am a founding contributor (one of many). I spent ions of time on this and the radar data is false that’s why the Malaysian military data has a 43 nm data diameter spike before Vampi. From times produced and missing radar times three across Malaysia. MH370 crossed Malaysia 35 nm north of Palu Pinang Cell tower connection attempted call data is not available. The call was made with Apple iPhone 5 wide band. These phones have high altitude reception according to police report their tests reported not able to connect with tower in question. MH 370 Turned north of Malaysias town Pendang at sea then onto Langkawi i’ts flight path close to the airport and around this side of Mt Gurung Raya. I might add the co pilot trained here and it was his cell phone that made the call. But I would not like to pin point which pilot was in control even both because they spent a full morning together before the flight. I now Jeff Wise interviewed the lady who saw Mh370 and he expressed it must have been flying through the eye of a needle. If you know radar the only link is Thai Radar and Chang Mai link. My data has the plane sighted by langkawi resident a witness time am 01.59’30. Soon after the plane disappeared T made a note of what the witness had said she went to the bathroom at around 2:00am.Then later speaking with Jeff Wise explaining fist time a plane from her point of view flying between Mt Gunung Raya and her place and apparently had landing lights on then headed north west. (this is where it gets tricky which way did it go? My bet is it turned west at degrees 6.29 N 100 E flew straight to Mekar am 2:22’18.I also might add in 2016 it appears a Saudi Flight flew almost the same route across Malaysia then down the coast to loiter for 1 hour on a main flight route around Palu Parek obviously testing radar and celltower messages and communication distance. their reason bad weather high winds on the normal route they had to refuel in Bombay passengers not happy. The aircrafts RDU unit was switched on at 02.20am allowance is made for the ‘Elms”software to load which appears to have taken nearly 2 minutes with an instant strike at Mekar waypoint by Thailands radar links. To set up autopilot the RDU and any input’Elms’ to acars and the autopilot selection mode would need to be loaded this later involved a correction to the north to locate 571 flight path also record first ping 02.28am .The speed was 498 knots at Mekar slower toward turn south and lower altitude at Loiter correction before turn 02.40.35am only 5 minutes flying time to Katy Tees yacht 300 kts the other transport plane Red and Yellow was 30 minutes later explains why MH 370 loitered at a lower altitude. Can you provide a reference ? It would be good to have a report of every detail of how the wing was damaged including all flex damage throughout the wings length. Quite a good recent article by Byron Bailey on MH370. He calls for an inquest as the ATSB is obstructing freedom of information requests. Though its probably the Malaysians holding the answers here. I note the most recent post on Victor Iannello’s site is starting to explore more ‘sinister’ possibilities. I would say there is a bit of a double standard when it comes to air safety. If this was a chemical plant accident with 249 lives lost, there would be hell to pay by the company in terms of financial damages, legal issues, public relations issues, finding the root causes, etc. And that is when it was an unintentional accident. For air accidents, there is more public acceptance and lack of concern about the causes. Part of this is due to the safety record of the industry, which is quite good. But I am not sure the chemical industry has any less safety record, if there was some way to put the accidents on a common basis of frequency. So it may have more to do with what the public is willing to consider acceptable vs. unacceptable, and air travel is an area where public is generally satisfied and unconcerned.